Like the Yeti Attack! box set before it, this collection contains audio material from 12 episodes of vintage Doctor Who. But in this instance the set comprises three four-parters rather than two six-parters, and so offers considerably more variety. Although each tale is a historical one, their combination demonstrates that such adventures cannot all be tarred with the same brush. Here we have a sophisticated high comedy (The Myth Makers), an earnest and educational drama (The Massacre) and a genre pastiche (The Highlanders). Whereas the earliest historical stories, Marco Polo and The Aztecs, had set out to educate younger viewers about the past, The Myth Makers relies on the sophistication of its audience by assuming familiarity with the legend of the Trojan horse, and with historical figures such as Achilles, Agamemnon, Odysseus and Homer. Writer Donald Cotton also builds upon a notion first suggested by the previous season's The Time Meddler, that of time travellers actually influencing the events of the past, rather than merely observing them, by having the Doctor devise the famous Trojan horse. This serial boasts great comic performances from the entire cast, and in particular Barrie Ingham as the blustering, craven Paris, Frances White as the melodramatic prophetess Cassandra, and William Hartnell himself, who always seemed more comfortable delivering comedy than complex scientific dialogue. Things become more serious in the final episode (as they do in Cotton's later serial, The Gunfighters) when the carnage of battle ensues. The Myth Makers is a wonderful example of the sheer diversity of the Hartnell era, and it's a real shame that the visual recordings no longer exist. The Massacre (or, to give it its longer title, The Massacre of St Bartholomew's Eve, as Peter Purves does when narrating the story) is almost as brilliant as The Myth Makers, though the tone could hardly have been more different. It, too, relies on the audience's sophistication, but not because of any familiarity regarding the events that take place. Indeed, writers John Lucarotti and Donald Tosh tackle one of the least well known subjects of all the historical Who stories, and tell a very talky tale to boot. As a result they educate audience members, young and old alike, about a complex and turbulent time in human history. The unfamiliarity of the subject matter also works to the benefit of the drama, because we empathise with Steven's (Purves) feelings of confusion and helplessness as a stranger in a strange land. This is very much the companion's story. Steven has never been better written during his tenure in the series, and Purves rises to the occasion to deliver a splendid performance. This tragic tale is slightly marred at the end by an illogical rationale regarding the heritage of new companion Dodo Chaplet (Jackie Lane) [see our nit-pick section], but that is a very minor point. 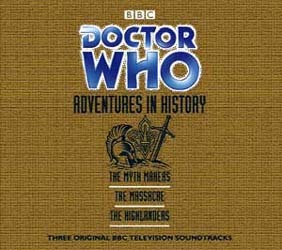 As an example of the genre pastiche style of historical story, The Smugglers would have been a better example to include in this collection, but I suppose the BBC wanted to provide more variety by including a Patrick Troughton serial. The Highlanders is the Second Doctor's only SF-free adventure (there can be only one, you might say!) and it would be the last one the TV series would ever attempt, except, perhaps, for Black Orchid in 1982. There is little educational value in this story, which is inspired by Robert Louis Stevenson's Kidnapped. Indeed, writer Gerry Davis makes the common mistake of portraying the Jacobite Rebellion as an Anglo-Scottish conflict, whereas the political reality was more complex. The Doctor is a man of relatively few words and little action in this serial - Ben (Michael Craze) and Polly (Anneke Wills) have more active roles, the latter teaming up with Hannah Gordon as Kirsty - but his antics are overtly eccentric. His characterisation would settle down in subsequent stories, but here he have him impersonating a German physician, with a very dodgy accent that wavers into Irish, and even dressing up as an old woman. Despite its inferiority to The Smugglers, The Highlanders is entertaining enough. It is also notable for introducing the popular and long-running character of Jamie, played by Frazer Hines, who narrates this CD. This box set offers great value for money, with a significant reduction on the prices of the stories' individual CD releases. So if you don't have them already, this is a great opportunity to own several pieces of Who history.